In 1975, before the consensus had received their mandatory James Hansen lobotomy – climate scientists understood that global cooling causes extreme weather, and global warming causes mild weather. The principal weather change likely to accompany the cooling trend is increased variability-alternating extremes of temperature and precipitation in any given area-which would almost certainly lower average crop yields. The cause of this increased variability can best be seen by examining upper atmosphere wind patterns that accompany cooler climate. During warm periods a “zonal circulation” predominates, in which the prevailing westerly winds of the temperate zones are swept over long distances by a few powerful high and low pressure centers. The result is a more evenly distributed pattern of weather, varying relatively little from month to month or season to season. 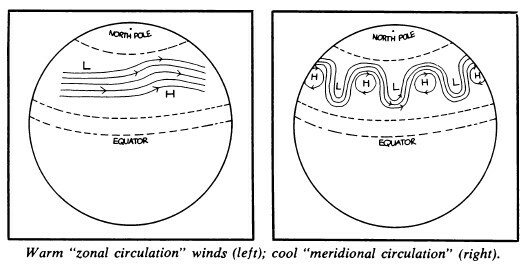 During cooler climatic periods, however, the high-altitude winds are broken up into irregular cells by weaker and more plentiful pressure centers, causing formation of a “meridional circulation” pattern. These small, weak cells may stagnate over vast areas for many months, bringing unseasonably cold weather on one side and unseasonably warm weather on the other. Droughts and floods become more frequent and may alternate season to season, as they did last year in India. Thus, while the hemisphere as a whole is cooler, individual areas may alternately break temperature and precipitation records at both extremes. It is funny how you can come across some old articles.